Baw Baw Taxis, an independent and competitive new taxi service in Warragul and Drouin, formally commenced business operations on 1/12/17. It initially began with a new Maxi Taxi/Dual Wheelchair mini-bus to service small passenger groups and local people with disabilities. This new business to the area was established by long-standing local taxi owner-driver Karl Lintzen to offer some choice in taxi services to our rapidly-growing local communities. 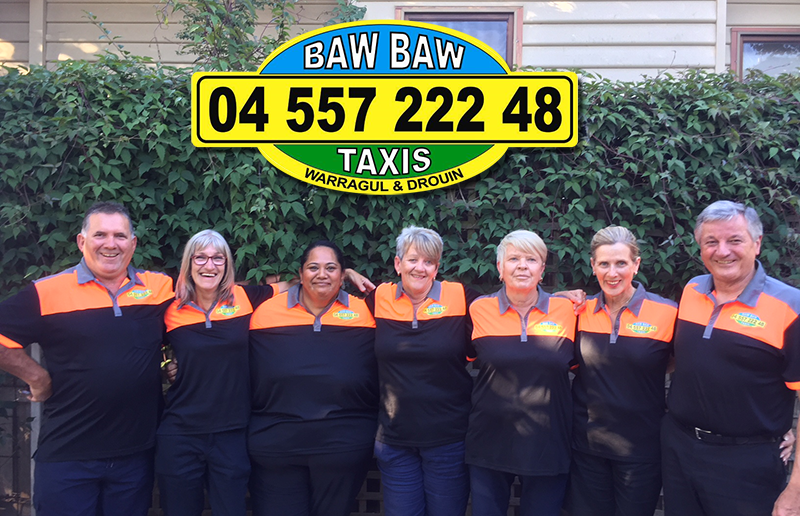 Baw Baw Taxis, since joined by well-known local taxi owner-drivers Andrew Boram, Denyse Greening and Robyn Kemp, and new owner-driver Alison Boram, has rapidly developed into a taxi network of nine vehicles, including two wheelchair accessible taxis, a station wagon and six sedans. We are supported by a team of well-known, friendly and experienced drivers who look forward to continuing their good service to our local communities. And as part of our ethos of social responsibility, we ensure that our drivers are legally accredited, business and tax registered, and are paid their full legal entitlements. Baw Baw Taxis also boasts the latest in taxi computerised dispatch technology, where your taxi needs are quickly assessed by our well-staffed, multiple-line Australian call centre, then fairly and silently allocated to a vacant cab near you. Bookings can be made by phone or our SmartHail app.